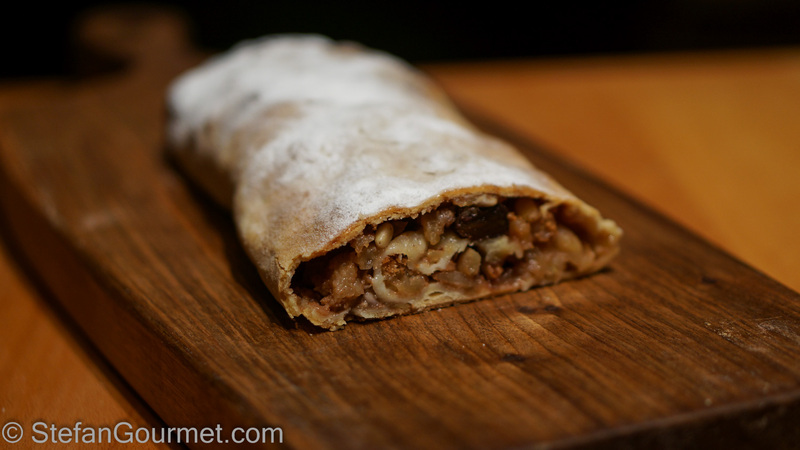 Traditional strudel isn’t made with puff pastry but with its own special dough. Although its origins are Turkish (related to baklava), it now mostly known as a recipe from Austria. 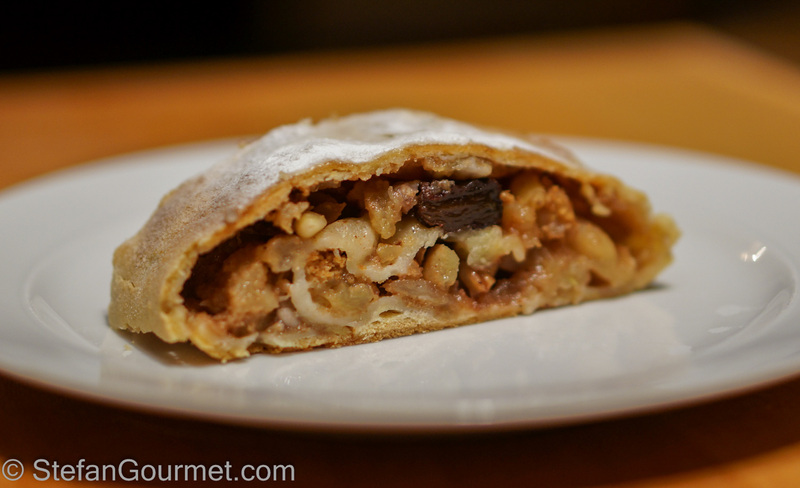 You can also find strudel in North-East Italy, because of the proximity of Austria and the region of Tyrol that used to be Austrian but is now Italian. 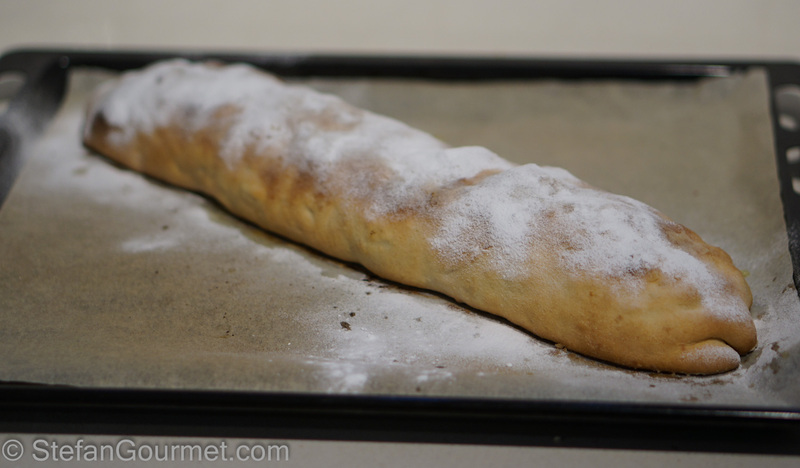 I’ve prepared this strudel using Marina’s mother’s recipe for Strudel di Mele from Le Recette di Baccos. Thanks Marina, for sharing the family recipe. The only difference is that I made only half. 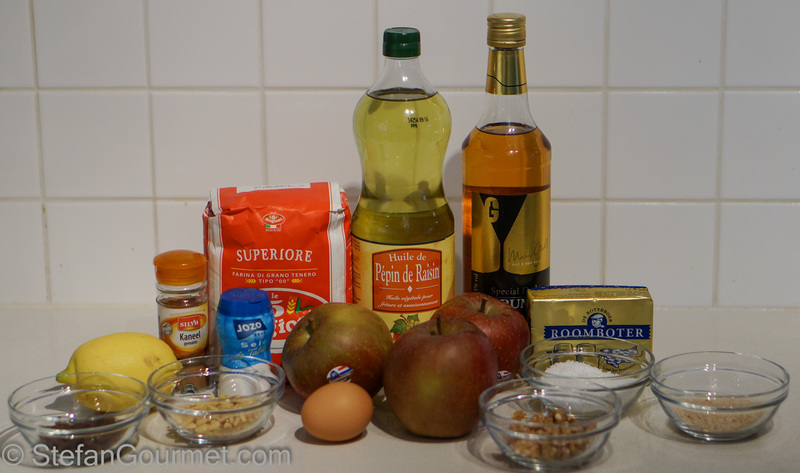 This apple strudel is not very sweet, and would also be great for breakfast. Some recipes put the sugar in the filling, others put the sugar in the dough. The dough is a bit tricky to work with, but with the help of a tea towel you should have no trouble baking your own traditional strudel without having to resort to store-bought puff pastry. 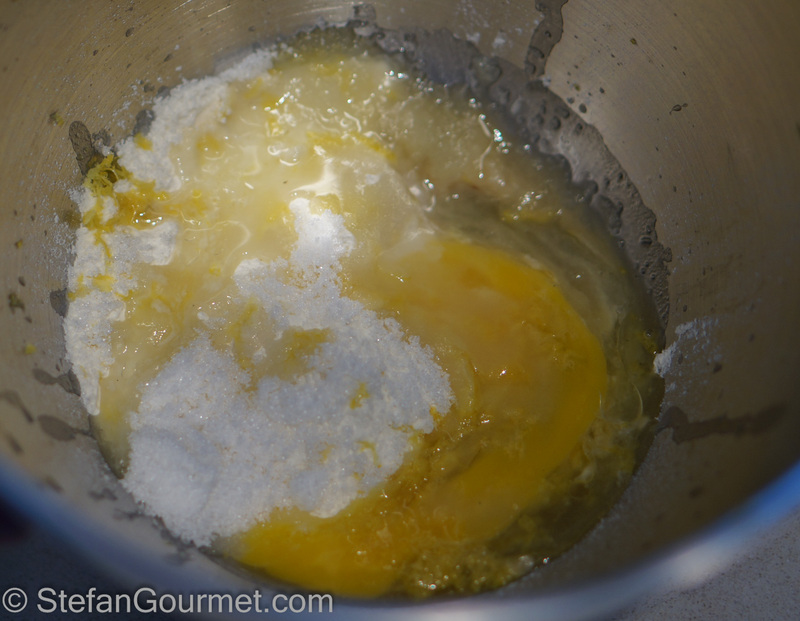 Combine the flour, vegetable oil, salt, sugar, egg, and lemon zest in the bowl of a stand mixer. 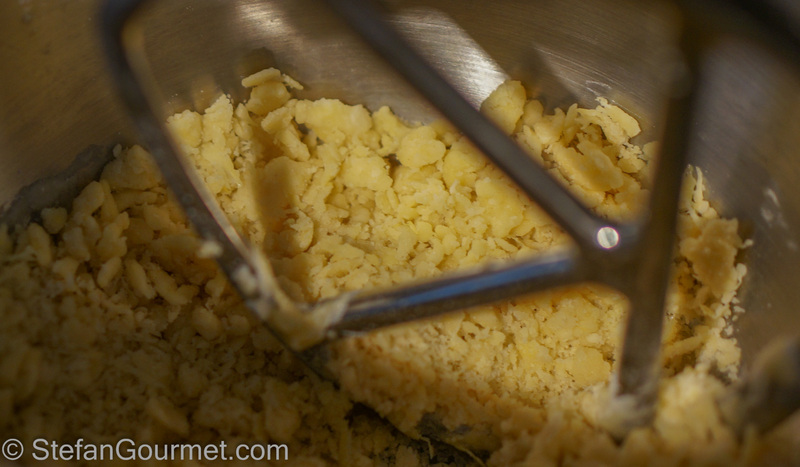 Mix with the paddle attachment until the dough becomes a crumbly mixture. Now add just enough lemon juice to make the dough come together. Do not add more than necessary, as that will make the dough very sticky. If it does become too sticky, add a bit more flour. 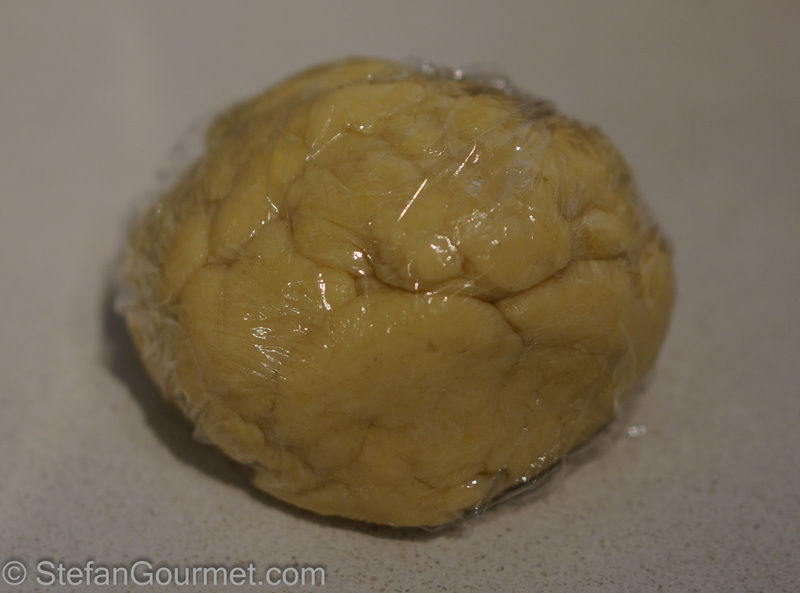 Wrap the dough in plastic wrap and allow it to rest at room temperature for half an hour. 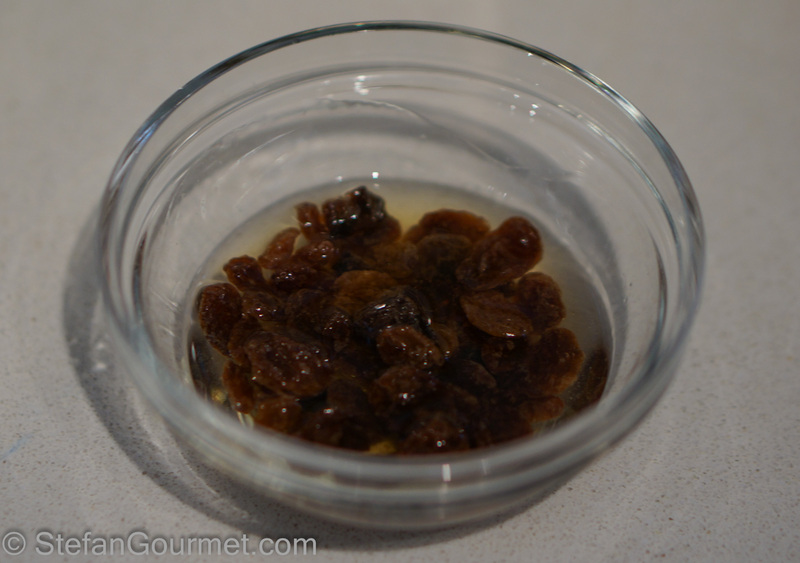 Put the raisins in a bowl and cover with rum. 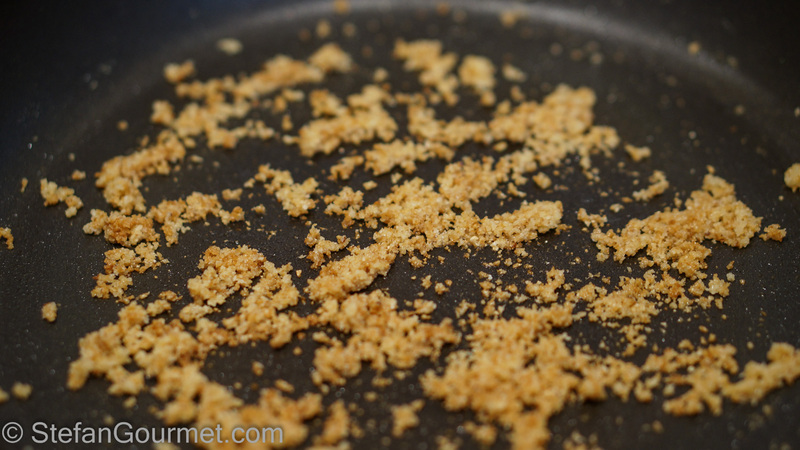 Melt a tablespoon of butter in a frying pan and brown the breadcrumbs over medium heat until they are crunchy. Peel, core, and shred the apples. 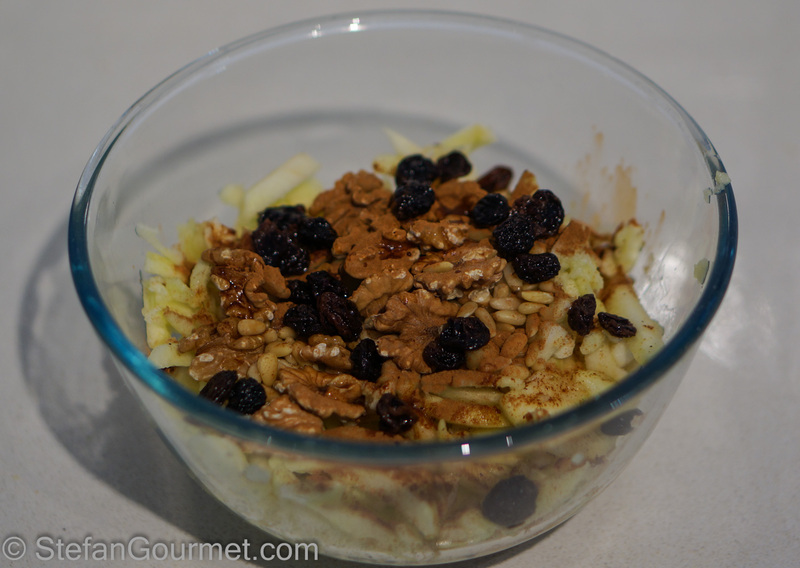 Put the shredded apple in a bowl together with the cinnamon, pine kernels, walnuts, raisins, and rum. Dust a tea towel with flour. 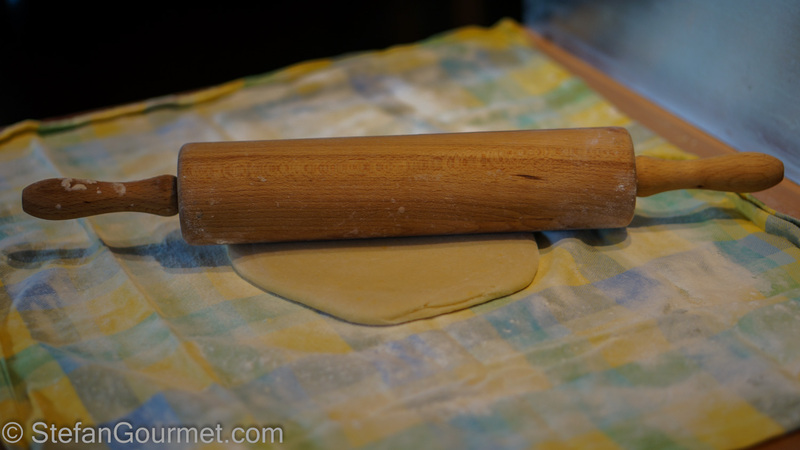 Use a rolling pin to roll out the dough on top of the tea towel. 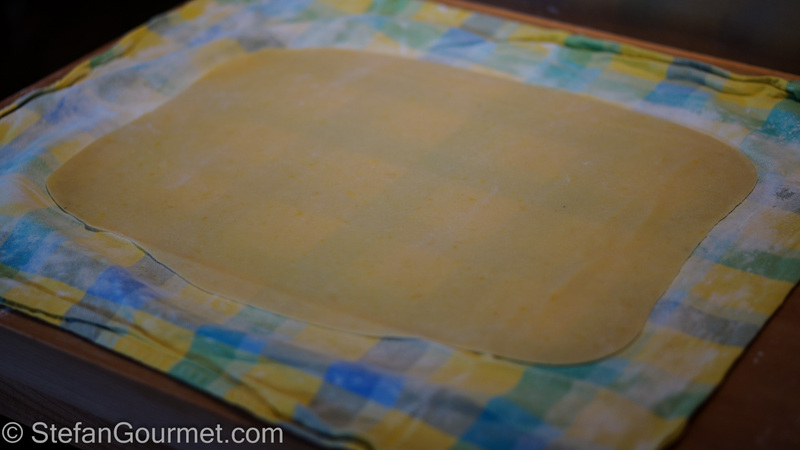 Roll the dough out to a rectangle of about 30 cm (12″) by 40 cm (16″). Preheat the oven to 200ºC/400ºF (not fan forced). 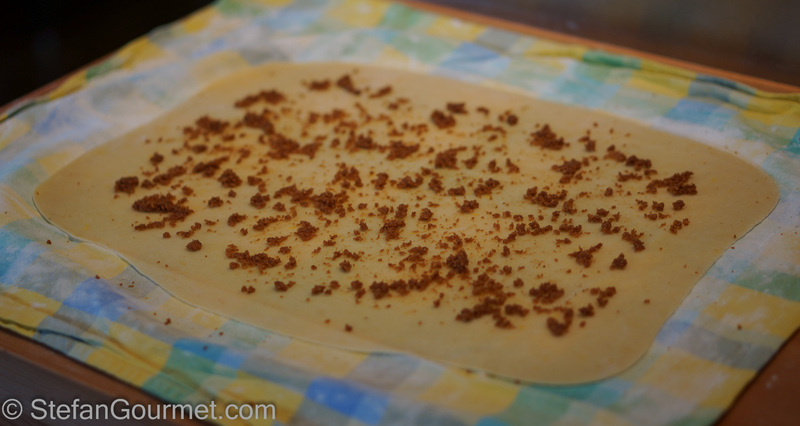 Spread out the breadcrumbs on top of the dough, leaving the outside 5 cm (2″) bare. 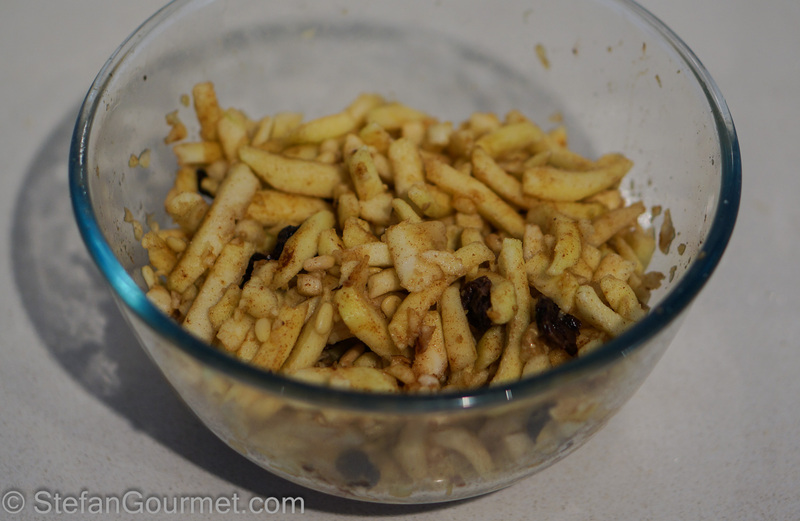 Cover the same area with the apple mixture. 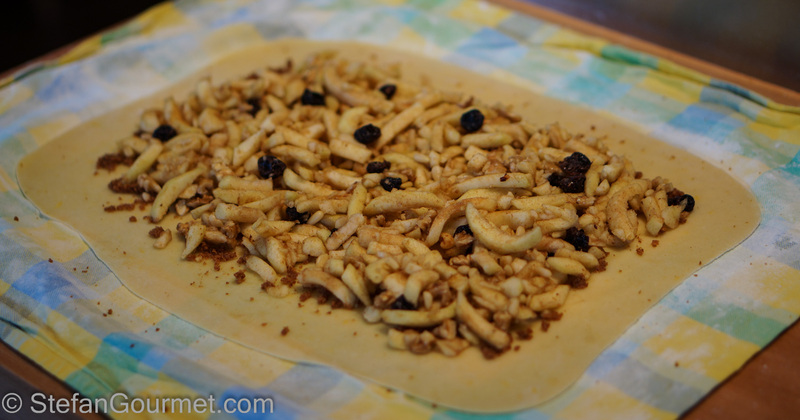 Roll up the strudel with the help of the tea towel. This was easier than I expected (unlike taking a good photograph of the process, apparently). Line a baking sheet with parchment paper. 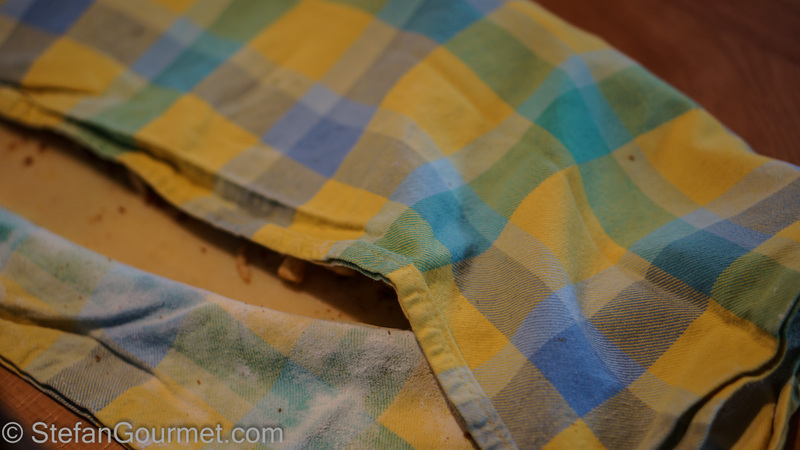 Use the tea towel to carefully transfer the strudel onto the parchment paper. Melt some butter and brush the top of the strudel with melted butter. Bake at 200ºC/400ºF (not fan forced) for 35-40 minutes. 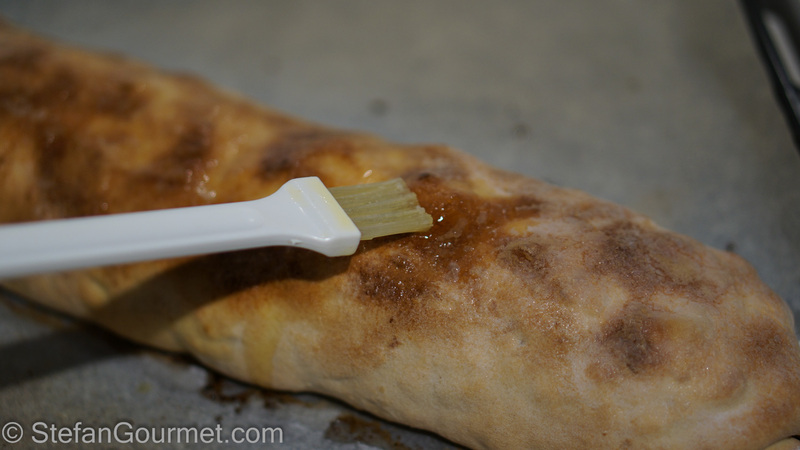 Take the strudel out of the oven and brush it again with melted butter while it is still hot. Sprinkle generously with powdered sugar, and allow to cool to room temperature before slicing. Because it is not overly sweet, this works well with Moscato d’Asti or a white dessert wine that is not very sweet. 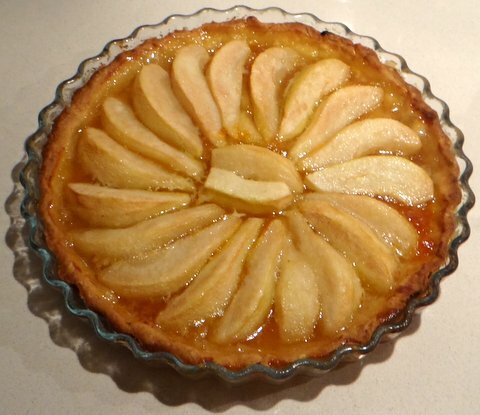 This pear tart is delicious and I will make it again myself soon! One of my favourite desserts ever! Looks delicious Stefan. Ti ringrazio per aver provato la ricetta di mia mamma e ti faccio i complimenti, ti è venuto perfetto;la pasta l’hai tirata bene, si vede la trama del canovaccio. Strudel da 10 e lode. Bravissimo! uno strudel eccezionale! Finchè ho le mele te lo devo copiare! ’tis the season! Thanks for the recipe and terrific photos. Great recipe but on your filling directions it says 25 grams (21/2 tbsps.) pine kernels and another ingredient says 25 grams (22/2tbsps ) for chopped walnuts .so is this right? both are 25 grams but the tbsps. confuse me pine says 21/2 and walnuts says 22/2tbps see what I mean? also what type of flour do you think it works with? AP, (all purpose)pastry? Thank you. Thanks for catching that typo. Both should be 2 1/2 Tbsp. 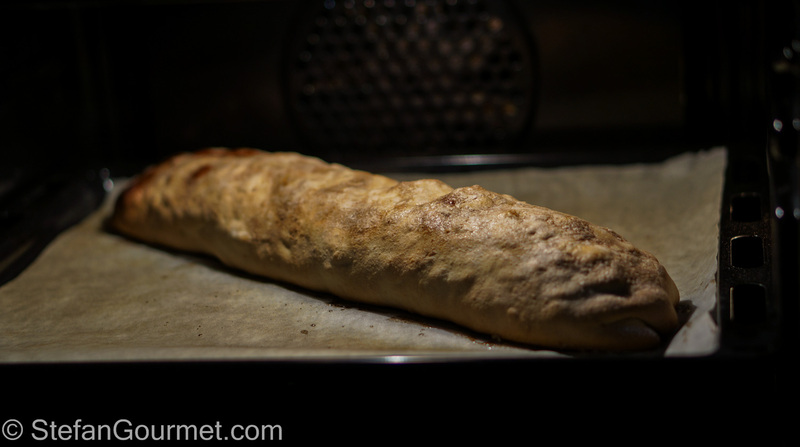 As for the flour, I used pastry flour so it would be easier to stretch out the dough. 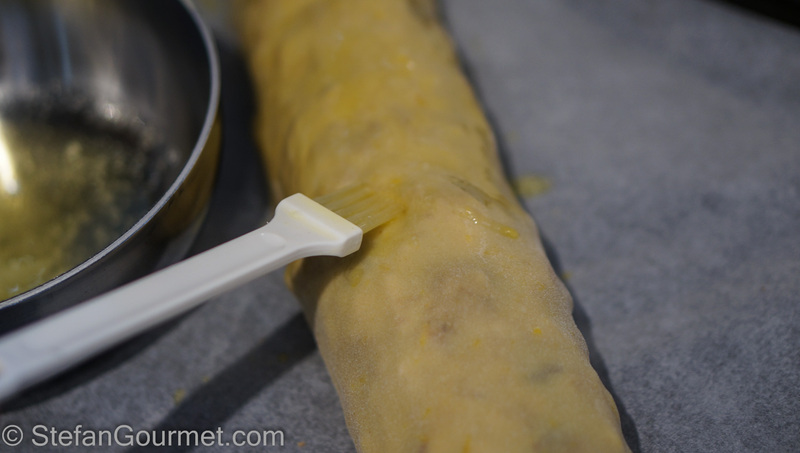 For a very traditional strudel, the dough should be stretched even thinner (according to legend so see-through thin you are supposed to be able to read a newspaper through it), and for that a high-gluten strong flour would be required. Oh ok both is 21/2 tbsps. and your flour is pastry ?Can I replace the flour ?I don’t have that and I only seen that flour at the culinary class I go to. Yes you can replace the flour. All-purpose flour should work just fine, as long as you are not trying to roll it out a lot bigger (and thus thinner) than I did. Although I do not bake I have stood by enough times watching strudel being made to know you have done a great ‘job’ of this! Glad you enjoyed!! I love apple strudel with Schlag and your recipe looks fantastic , I will try it when I get home. I remember the bakeries in Tyrol . Ma se un mago. Come hai fatto a stendere un rettangolo così preciso con un mattarello così corto? Scherzi a parte, un vortice perfetto! Complimenti! I lucked into a strudel-making demo at the castle in Vienna a few years back. I bought a piece of pure linen at the fabric shop when I got home, so I could practice what I learned. It came out beautifully! It’s not really that hard and I urge anyone reading this to give it a try. You’ll impress everyone who tastes your efforts 🙂 – as I’m sure your guests were, Stefan!